Stumbled into a Cost Plus World Market near my place and discovered a traveler foodie’s heaven. How did I not know that Cost Plus World Market stocked quirky and irresistible specialty food items from around the world? About $100 later, Hubby and I walked out with many bottles of specialty beers, some wine, Dutch snacks, German honey, Swedish pancake mix and other small things. 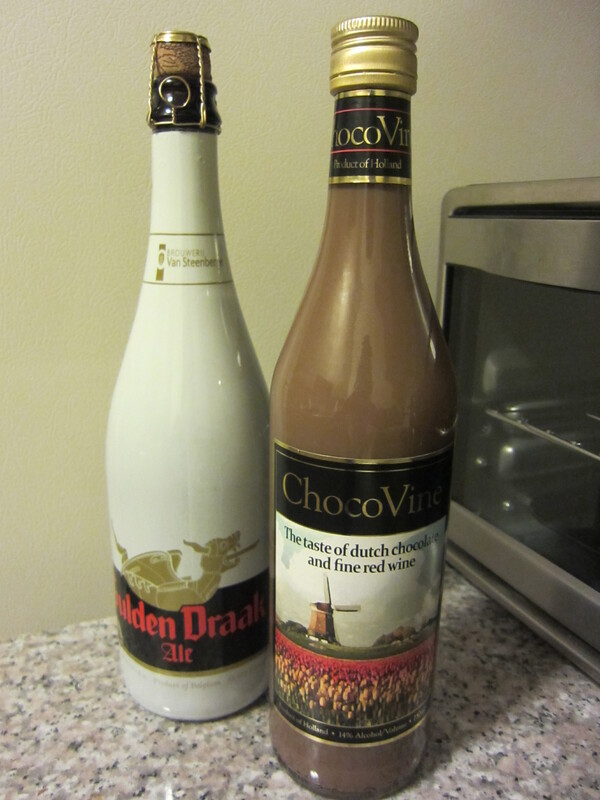 My favorite find – ChocoVine, a Dutch import consisting of Dutch chocolate and French Cabernet, 14% alcohol content. ChocoVine, where have been you been my whole life? While I enjoy you poured over some vanilla ice cream or alone after dinner, Hubby drinks his Gulden Draak, which is far too bitter for my taste but brings him indescribable joy. I’ve heard of pairing red wine with chocolate, but in the same glass? or worse yet the same bottle? What’s it like? It actually just tastes like really strong chocolate milk…creamy like Kahlua and Bailey’s. I wouldn’t get it if you’re looking for wine, it’s more of a dessert drink.